Barnhart Crane has been called to do some unusual things. For example, we installed several 3,000 lb bronze sculptures by Fernando Botero outside a Memphis Museum. We moved an antique locomotive to Minute Maid Park, the Houston Astros baseball stadium. We transported an 800-ton stator to a Mississippi nuclear power plant. Yes, we’ve had jobs that could be considered whoppers. But we’ve never actually moved a whopper. A 2014-pound bacon-cheeseburger, that is. 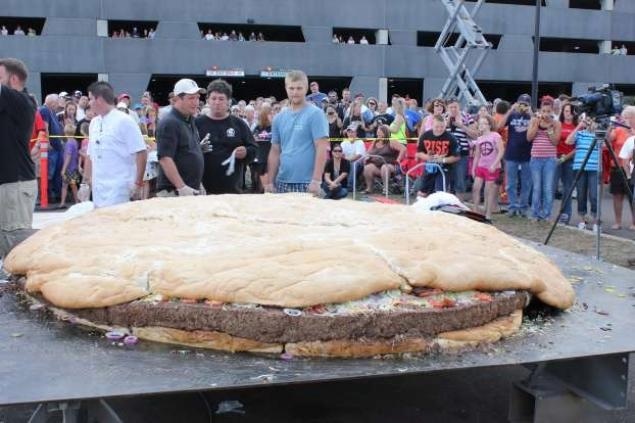 Over Labor Day weekend, the Black Bear Casino Resort in Carlton, Minnesota, set a Guinness Book Record for the world’s biggest burger. The mammoth burger measured 10 feet in diameter and was topped with 60 pounds of bacon, 50 pounds of lettuce, 50 pounds of sliced onions, 40 pounds of pickles and 40 pounds of cheese, according to the Duluth News Tribune. It took about four hours at 350 degrees to cook the patty. The bun by itself took more than seven hours to bake. An outdoor oven powered by propane torches and 15-foot steel skillets were specially-built for the feat. When it was done, the burger was served to guests free as part of the casino’s Big Burger Bash. “What I saw today was a feat of remarkable teamwork that resulted in a world record burger that actually tastes really good,” said Guinness Book adjudicator Philip Robertson in a news release. Black Bear Casino smashed the previous record for biggest burger which weighed in at a petite 881 pounds. 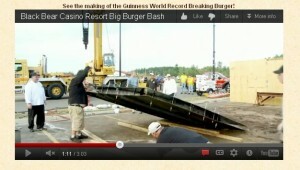 Click here to view the making of the record-breaking burger! Meredith Portman is a freelance writer who specializes in heavy industry, healthcare and education. This entry was posted in News and tagged Barnhart Crane, Crane, Guinness Book, World's biggest burger. Bookmark the permalink.